In January 2019, as part of our project on the Prevention and Redress of Wrongful Convictions, USALI launched its fourth lecture trip to China with a special focus on forensic science and wrongful convictions. The trip was composed of four lectures/round-table discussions at China University of Political Science and Law, Nankai University, and Renmin University. Mr. Chris Fabricant, criminal defense lawyer and Director of Strategic Litigation Department of Innocence Project, and Professor Simon Cole from UC Irvine joined us to share challenges and issues within forensic science and its impact on wrongful convictions in the United States. Our three-day lecture tour reached close to 200 people, including Chinese scholars, practitioners, students and experts from other fields, in addition to being widely shared through social media. This lecture trip focused on raising the awareness among Chinese about the court application of forensic science and scientific evidence, and its contribution to wrongful convictions. Throughout their presentations the two experts shared their experience in handling cases and their their perspectives on history of DNA exoneration, and the work of Innocence Project and National Registry of Exonerations. Cole and Fabricant also shared their research on the root causes of wrongful convictions and the common flaws that forensic science contributes, the application of forensic science in court, subsequent reforms in this field, and current status quo of such reforms. 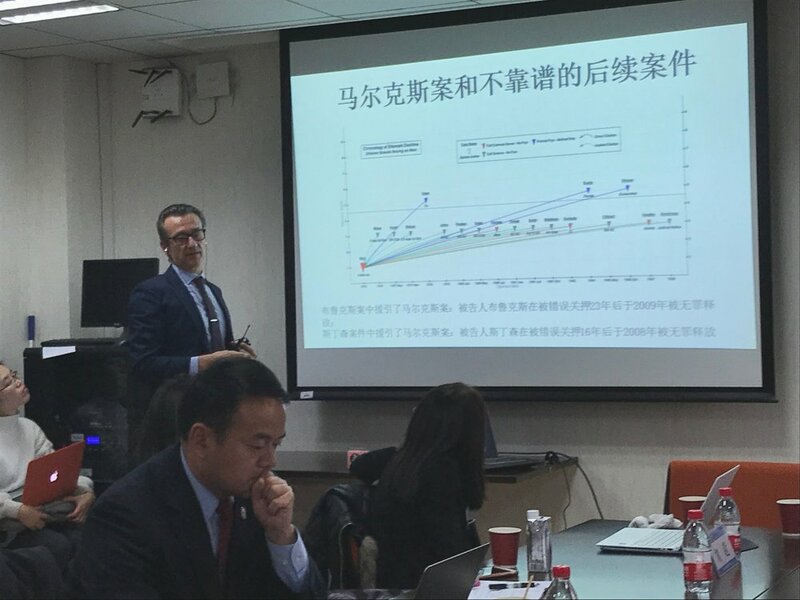 With the help of our Chinese partners, we were able to engage in fruitful discussions with Chinese experts with a background in forensic examination or crime scene investigation, or professors researching evidence law, forensic evidence, and wrongful convictions. Throughout our Q&A sessions, Chinese experts shared the situation of wrongful convictions in China, deficiency of the system of forensic examination that leads to wrongful convictions, existing rules and mechanisms on accreditation of forensic examination organizations and quality control over cases. Experts from both countries also had in-depth conversations about topics such as bitemark evidence and hair microscopic comparison as practiced in China, how to ensure the chain of custody to prevent contamination, validity of certain forensic disciplines such as pollutant examination, AI and digital forensic examination, DNA profiling, as well as validation research and statistical analysis on certain forensic disciplines that have been done in this field. As Executive Director Ira Belkin noted, “despite differences in criminal justice system and disagreements among experts, we should at least reach three agreements:1) we should not accept scientific evidence as science just because it is called scientific; 2) forensic scientific evidence should be validated by using scientific methodology 3) experts who provide evidence in court should be honest about the value of evidence and avoid from misleading fact-finders into believing the absolute correctness of their results.” Professor Zhu Tonghui from Nankai University also added, "we should try to do away with superstition and evaluate evidence from a truly scientific perspective.” He also added, “We shall work harder in learning both laws and science and conduct such kind of exchange more in the future." These events were widely covered through traditional and social media reporting, suggesting potential impact on a larger audience. For each event, we have collected WeChat articles that are both informative and highly readable; the event at CUPL was also reported by Legal Daily, a major newspaper covering legal issues that has a big readership; the event at Nankai has been reported by Nankai University official website and reposted by Tianjin Criminal Procedure Law Academy and received high click rate. In conclusion, we regard this lecture trip as a successful activity and we appreciate the support from US experts, Chinese partners and audience who worked together in presenting such a great series of events.